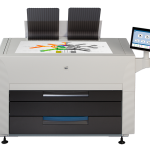 Konica Minolta wide format printers make superior systems for viewing and printing wide-format engineering drawings, public-works documents and more -- with compact design, modular options and scaleable configurations that suit both headquarters and field operations. Fast output, superior image quality and simple operation keep wide format printers productive even during peak volume demands. The productivity of the KIP 7170 system is designed to satisfy the most demanding needs of decentralized users. 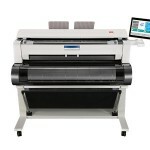 The KIP 75 Series — comprised of the KIP 7570, 7580 and the 7590 — is a new series of wide format printers on your production team that offers high-speed, wide-format output, high-resolution print quality and simple touch-screen control as easy to operate as a familiar tablet. 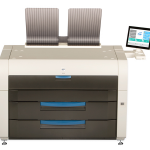 With compact top-stacking design, two or four integrated media rolls and an optional scanner, you’ll have a system that fits any application or workspace. 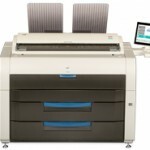 Today’s networked world demands a document solution with greater speed, power and productivity -- and the Konica Minolta Bizhub 224e from Athens Digital Systems gets the job done. TThe KIP 7770 System features an innovative top stacking design that fits where you need it—in tight spaces or against a wall, delivering easy access to all system features and enhancing workflow productivity. . 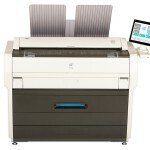 The new KIP 79 Series offers you high speed and convenience for greater productivity in wide-format applications. This series features a vivid 12” color multi-touch display that makes operation simple on wide-format printers, along with convenient top-stacking design that supports two or four integrated media rolls. Combined, you get a powerful, scalable system to fit the needs of your application. The KIP 7970 System features an innovative top stacking design that fits where you need it—in tight spaces or against a wall, delivering easy access to all system features and enhancing workflow productivity.